We moved to central Oregon in the year 2000. We've been going out into the National Forest to cut our own Christmas tree since we moved here. We've only missed (maybe) two years. It's a fun, family experience. We get the tree cutting permit, complete with a guide to the types of trees we will find in the forest. The kids always liked to run around identifying the trees. Now they like brandishing the saw. Some years there's more snow in the forest than other years. I had back surgery in July of 2001, and wouldn't you know it, that was a year with more snow fall. Even by December of that year, my back hadn't healed enough for me to be able to trudge through knee deep snow. But, of course, we didn't find that out until we'd already trekked out, found and cut down the tree, and were heading back to the car. Yeah...my poor, poor husband. I was literally worried that I was not going to be able to make it back to the car on my own...but we also had our four young kids with us; ages 8, 7, 3 and 2. Those of you familiar with both knee deep snow and toddlers will know - they don't mix. That poor husband of mine had to put one toddler on his shoulders and piggy back the other, plus he'd trussed the tree up with a rope, tied it around his waist, and dragged it behind him. I'm pretty sure the 7 year old was carrying the saw. Not my best parenting moment, but we all made it back to the car, tree in tow, and with all of our fingers and toes. There have been years we had to put the tree into the tree stand and set it atop a pile of drop clothes for a day or two while it literally thawed out. 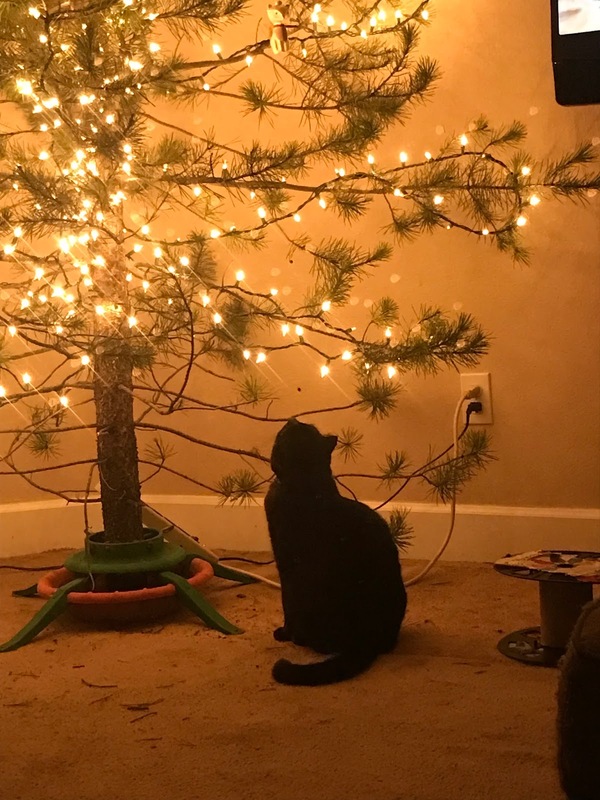 You don't want your tree dripping on the lights, after all. The forest service gives us clear guidelines about the tree we can harvest. The one thing I remember each year is the tree can't be taller than twelve feet. We have a vaulted ceiling in our living room, so the generous height constraint isn't an issue. As a matter of fact, we tease my husband that twelve feet gets taller each year. As we stood in the forest this December, my husband pointed and asked, "How about that one?" My son and I both responded, "You mean the twenty foot tall one?" We were barely able to restrict him to twelve feet, yet we managed. As we drove home with our freshly cut tree hanging over both the front and back of the car, I joked that at least we didn't have a root ball on our tree, referring to the Griswald family Christmas tree from the movie, Christmas Vacation. But we ended up with another beautiful tree just how I like them, with plenty of space between the branches to show off all of our unique ornaments. See? Beautiful. Ginormous, but lovely. However, even after 17 years, we are still running into unusual situations. This year was indeed a first. We got the tree home. It wasn't frozen solid, so we could decorate it right away. We kept it watered. Everything was great. 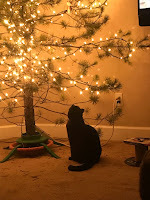 Then the cats started to sit under it and stare at it...for an hour at a time. Just stare up at the trunk. I stalked around, peering at the trunk to see if I could spot what captured their attention, but nope. Nothing. Until about two weeks after we brought it home. When the cats started to stand on their back feet to reach toward something on the trunk. Even then it took me awhile to figure it out. Caterpillars. Fricking caterpillars. We found two that night and a couple more over the next couple of weeks. But how many DIDN'T we find? 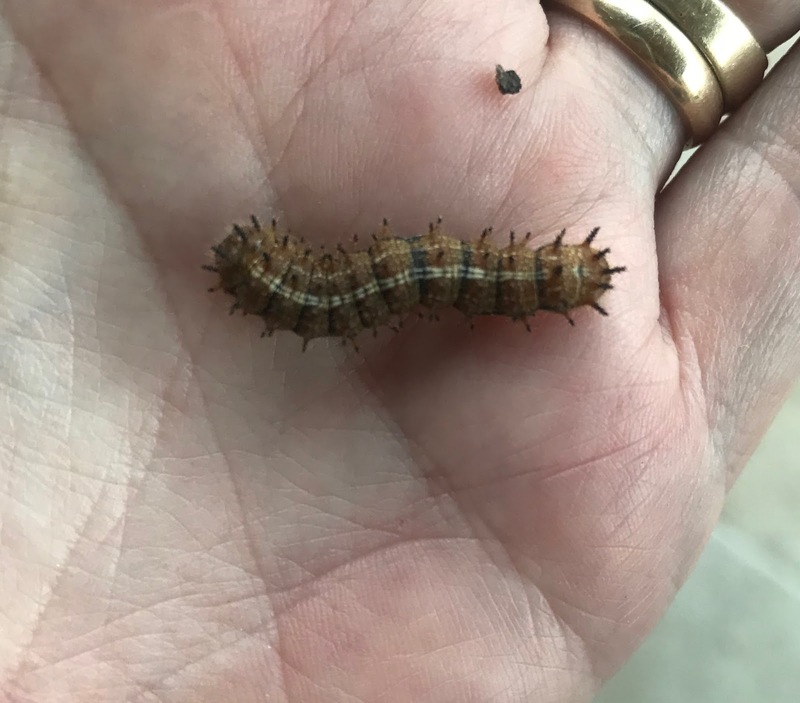 I tried to cross reference what kind of caterpillar it was so that I'll know what to expect to fly around my house in spring! But the closest cross reference is a Fritillary butterfly, though its caterpillar appears to have furry spines and my caterpillars had knobby spines. So...who knows. At least it wasn't a squirrel. Do you have any tree harvesting stories to share? I'd love to know I'm not alone in this! What beautiful Christmas experiences and memories. We never cut our own tree, but bought them at one of the tree lots where they were sold. And just imagine, your own butterflies. And that is a gorgeous tree. The last one I put up, the cat climbed and knocked it down. We've been so lucky that the cats haven't tried to climb it. Especially after they saw the creeping caterpillars!